The 95-room Blue Mountain Inn sits atop the Niagara Escarpment on the southern shores of Georgian Bay, roughly a 90-minute drive north of Toronto. 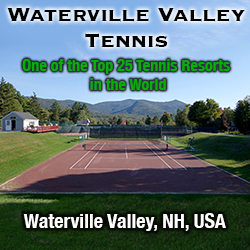 It has a Pavilion called Monterra Tennis with 5 indoor Omni (artifical grass) courts, which are open year-round, while the inn proper has a single outdoor court available accessible to overnight guests. Also at the resort is an 18-hole golf course, access to a lakefront beach (10 minutes away), mountain biking trails, indoor and outdoor swimming pools, a water slide, and a health club with spa services. The tennis programs are limited to private lessons (or group lessons if you have 4 people) and game matching for adults and two-hour-a-day kids' camps for those ages 7-15. Options range from hotel rooms and studios to 3-bedroom condos and 4-bedroom homes. See the resort's web site for options and rates.